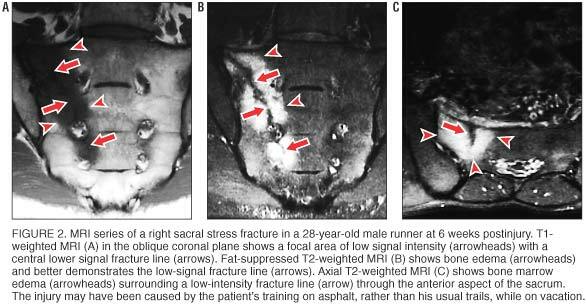 In Brief: Sacral stress fractures are an underrecognized cause of low-back and gluteal pain in distance runners. The combination of low bone density and increased activity blurs the boundary between fatigue and insufficiency fractures in many runners. MRI is the preferred radiologic technique because of its ability to localize the site of injury and rule out tumors, disk disease, or sacroiliitis. By identifying the condition early, clinicians contribute to a favorable outcome and help most athletes return to full activity in 12 to 14 weeks. Sacral stress fractures are reported with increasing frequency in the orthopedic and sports medicine literature. In 1989, Volpin et al  reported the first series of three sacral stress fractures from a group of 257 fractures in 194 of 380 Israeli army recruits. Since that time, 11 case reports [2–15] have documented sacral stress fractures in athletes, mostly in distance runners. Similar to other reports of stress fractures in runners, most of the case histories note a recent change in mileage, training surface, or training intensity. In female athletes, a history of amenorrhea and low bone densitometry results are common. To our knowledge, our case series over the past 6 years is the largest of its kind in the literature. Epidemiology. We detected sacral stress fractures in 21 distance runners (12 women and 9 men), who had 22 fractures. Fifteen runners were on the Stanford University cross-country and track teams, 5 were members of the local postcollege running club, and 1 was a longtime recreational runner. The average age was 21.4 years; 5 women and 2 men were college freshmen. Similar to a study of tibial stress fractures,  we found college freshmen runners to be at particular risk for sacral stress fractures. Freshmen accounted for 33% of the injuries, with women representing nearly three-quarters of these cases. Injury mechanics. Most injuries occurred during accelerated training during the cross-country or track season. One male athlete sustained injury during summer vacation while training more than usual on pavement. Another man was injured while training on ice-covered roads at home during a winter school break. Two injuries occurred with no discernible changes in training patterns. Presentation. No specific pain was consistently reported at presentation. Athletes described symptoms of unilateral, nonspecific, low-back, buttock, or hip pain exacerbated with weight-bearing activity. On exam, all had localized tenderness to palpation in the sacral region, and their pain was reproduced with hopping on the involved limb. Radiology. Fifteen injuries were confirmed by magnetic resonance imaging (MRI), 9 by bone scan, and 2 by both imaging studies. Of the 15 who had MRI studies, 9 showed evidence of a full stress fracture with cortical disruption, and 6 had evidence of marrow edema without evidence of cortical involvement. Bone density studies were obtained on 18 athletes, (12 women and 6 men, 19 fracture episodes). The T–score is a statistical comparison of a patient's bone density and the peak mean bone density of young normal controls. A value greater than –1 standard deviation (SD) is considered normal, between –1 SD and –2.5 SD indicates osteopenia, and less than –2.5 SD shows osteoporosis. For the women, the average lumbar spine T–score was –1.52, and the average hip T–score was –0.33. For the men, the average lumbar spine T–score was –0.55, and the average hip T–score was 0.28. According to the T–score comparison criteria, 7 women were osteopenic, and 2 were osteoporotic; 2 men were osteopenic, and 4 were within normal limits. These abnormal findings were confined to bone density evaluation in the lumbar spine. Only the 2 women with the lowest overall values in the lumbar spine also met criteria for osteopenia in the hip. Treatment. All subjects were restricted to non-weight-bearing status until they could ambulate without pain (typically 1 to 2 weeks). Then they were cleared for nonimpact training in the swimming pool or on a stationary bike for 6 weeks. This was followed by a very gradual return to impact activity and preinjury training level that included instruction in hip-girdle and lower-abdominal strengthening exercises to help support running mechanics and attenuate forces transmitted to the underlying bone. Two of the women were amenorrheic at the time of their injuries, and they were started on hormonal supplementation with oral contraceptives after other endocrine disorders had been ruled out. Seven women (8 fracture episodes) were already taking oral contraceptives at the time of injury for preexisting amenorrhea. The brand of oral contraceptive was individually selected based on each woman's tolerance of side effects. Outcome. All 21 subjects' (12 women and 9 men, 22 fractures) sacral stress fractures healed. 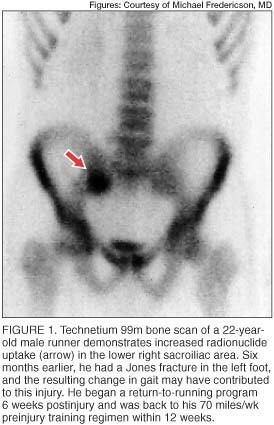 Most were monitored by clinical exam; however, follow-up computed tomography (CT) scans were obtained in 3 of the athletes. Based on the severity of cortical disruption seen on initial imaging and our perceived need to ensure bony union prior to starting an earlier-than-normal return-to-running protocol in preparation for major competitions, we felt the additional CT scans were warranted, though it is well known that bony healing can lag behind clinical improvement of symptoms. Many types of imaging are readily available, but some provide better evidence of sacral stress fractures. Plain radiographs are not sensitive enough for reliable diagnosis of sacral stress fractures. In one study,  only 9.8% of initial radiographs were abnormal in a group of 320 athletes who were eventually found to have stress fractures. Eller et al  reported that sacral stress injuries were only evident on initial radiographs in 2 of 17 patients who were later confirmed to have stress fractures. Compounding the general insensitivity of radiography for stress injuries, the sacrum is notoriously difficult to evaluate radiographically because of overlying bowel gas, soft tissues, and attempts to shield the reproductive organs from radiation. All of our athletes had negative plain radiographs at the time of initial presentation. In long bones (eg, tibia, metatarsals, femur), classic radiographic signs of stress fracture include cortical disruption, linear radiolucencies, or periosteal new bone formation. In primarily cancellous bones (eg, calcaneus, tarsal navicular), stress fractures may appear as a band of sclerosis with or without a radiolucent fracture line. The cortex of the sacrum is relatively thin, and findings are primarily seen in the larger cancellous component. Although bone scans have long been used as the most sensitive diagnostic study for detection of stress fractures, this modality is not without limitations. The radiation dose delivered to the patient, typically 4 millisieverts, is much greater than the dose in routine radiographs. Also, the spatial resolution of bone scans is limited. Increased activity in the sacral region, whether symmetric or asymmetric, may be interpreted as arising in the sacroiliac joints when caused by either sacroiliac joint dysfunction or sacroiliitis. MRI is increasingly used as a diagnostic tool for stress injuries because of its cross-sectional capabilities, increasing availability, and, in some centers, the application of limited, cost-effective protocols. Additional advantages of MRI include the ability to precisely define the anatomic location (eg, differentiation of a sacral fracture from sacroiliac joint disease), the ability to rule out bone or soft-tissue tumors, and the absence of ionizing radiation. If sacroiliitis is the suspected diagnosis, additional sequences after intravenous administration of gadolinium may be helpful. When patients have mixed symptoms of possible stress fracture and possible disk disease, the study can be extended to evaluate the lumbar spine. Osseous stress injuries demonstrate characteristic signal intensity patterns with MRI. In long bones, early stress injury (stress reaction or response) manifests as a spectrum from periosteal edema, to marrow edema, to a discrete fracture line. In general, fat-suppressed T2–weighted images are the most sensitive for detecting a stress reaction or fracture. In stress reactions involving cancellous bones, such as the sacrum, MRI shows relatively low signal intensity in the marrow space on T1–weighted images (figure 2A) and relatively high signal intensity on fat-suppressed T2–weighted images (figure 2B). When an actual fracture line is present, T1– or T2–weighted images show linear areas of low signal intensity centered in the geographic zone of bone edema. Sacral stress fractures are typically unilateral abnormalities involving the sacral ala, as seen in our athletes. When a fracture line is present, it is most often incomplete, involving the superolateral anterior cortex and extending inferomedially through the first few sacral segments (figure 2C). The distinction between fatigue fractures and insufficiency fractures may become blurred, especially in young athletes who have low bone density and increased impact activity. Fatigue stress fractures occur when bone of normal structure and mineral content undergoes excessive impact loading or muscular forces, whereas insufficiency fractures occur when bone of abnormal structure or deficient mineral content is subjected to normal physiologic stresses. Insufficiency fractures are seen most frequently in elderly women who have risk factors, including osteoporosis, rheumatoid arthritis, or a history of radiation or steroid therapy. In young women, a stress fracture in cancellous bone, such as the sacrum, is often associated with early-onset osteopenia. Nine of 12 women in this study who had sacral stress fractures had histories of amenorrhea. On bone densitometry studies, 7 met criteria for osteopenia, and 2 had osteoporosis. Three women had histories of normal menses; 2 had normal bone densitometry studies, and the other met criteria for osteopenia. Of the 9 men who had sacral stress fractures, 6 had bone densitometry studies, and 2 met the criteria for osteopenia. It is possible that if all the men had obtained bone densitometry studies, we would have identified a higher percentage with osteopenia. Hetland et al  have shown that male long-distance runners are also susceptible to reduced bone mass and increased bone turnover when compared with controls. Female runners who have amenorrhea should be screened for disordered eating and encouraged to obtain 1,200 mg to 1,500 mg of calcium per day with 400 U to 800 U of vitamin D. A dietary analysis should also screen for adequate calorie intake. If no spontaneous menses occur with nonpharmacologic treatment, estrogen replacement therapy, typically in the form of an oral contraceptive, should be considered. We know of no randomized, controlled studies of estrogen replacement in athletes, but one nonrandomized study  of a small group of athletes did suggest considerable gains in bone density. If osteopenia is present, other treatment options include the use of nasal calcitonin-salmon. Drinkwater et al  studied the effects of calcitonin-salmon for 1 year in young amenorrheic athletes and found a significant increase in bone mineral density in the spine and proximal femur. Bisphosphonates are currently approved for the treatment of postmenopausal osteoporosis; however, there are concerns regarding their use in women of child-bearing age because of the reported teratogenic effects in animals. Risedronate sodium has a shorter half-life and may prove to be safe in young women, but further research is necessary. The return-to-running protocol will be specific for each patient based on the severity of the injury and the previous intensity of training and typical mileage. The patient must avoid weight bearing until he or she can walk without pain, typically 1 to 2 weeks, then nonimpact training (eg, stationary bike, pool running) is begun. When this can be done without pain, a very gradual return to impact activity and preinjury training level is allowed. Rehabilitation includes hip-girdle and lower-abdominal strengthening exercises to reduce the impact forces exerted on the injury and to help support running mechanics. All 21 of our athletes were cleared for a return-to-running protocol within 8 to 12 weeks postdiagnosis and resumed preinjury training levels by 3 to 6 months. A recent study by Johnson et al  reported sacral stress fractures in eight female athletes who averaged 6.6 months before symptoms resolved and 8 months to preinjury activities. One reason for this discrepancy may be that we have a high index of suspicion for these fractures, so we make the diagnosis at an earlier stage and recommend immediate cessation of impact activity. All of our runners were diagnosed within 1 week after coming to our clinic. Running athletes often report impact-induced low-back or gluteal pain, and the diagnosis of sacral stress fracture may be frequently missed. MRI is the imaging modality of choice because of its ability to precisely determine the anatomic location (eg, differentiation of a sacral fracture from sacroiliitis), the ability to rule out bone or soft-tissue tumors, and the absence of ionizing radiation. In addition, for patients with mixed symptoms of possible stress fracture and disk disease, MRI can be extended to evaluate the lumbar spine. CT is recommended to evaluate for bony sclerosis if the extent of fracture healing is uncertain, but most athletes can be monitored clinically to determine a return-to-activity plan. Because treatment of sacral stress fractures consists primarily of rest from impact and weight-bearing activities, early identification allows athletes to commence the rest period with reassurance from the physician that they will typically be able to start a gradual return-to-running protocol within 8 weeks. Stress fractures of the sacrum following strenuous activity. Unique sacral stress fracture in a runner. Sacral stress fracture in a runner. Stress fractures of the sacrum in runners: two case reports. Stress fracture of the sacrum in two distance runners. Adolescent stress fractures of the sacrum: two case reports. Sacral stress fractures in athletes. Sacral stress fractures in long-distance runners. Lumbosacral pain in an athlete: an unusual site for stress fracture. 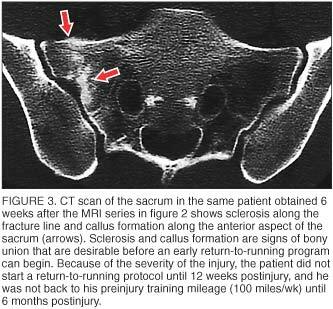 Stress fractures of the sacrum: an atypical cause of low back pain in the female athlete. Sacral stress fractures: an unusual cause of low back pain in an athlete. Tibial stress reaction in runners: correlation of clinical symptoms and scintigraphy with a new magnetic resonance imaging grading system. Stress fractures in athletes: a study of 320 cases. Stress fractures: a classification of the earliest radiographic signs. Sacral insufficiency fractures: an unsuspected cause of low back pain. MR imaging of stress reactions, muscle injuries, and other overuse injuries in runners. Stress fracture sites related to underlying bone health in athletic females. Low bone mass and high bone turnover in male long distance runners. Estrogen replacement therapy and female athletes: current issues. Effectiveness of nasal calcitonin in preventing bone loss in amenorrheic women, abstracted. Low bone density is an etiologic factor for stress fractures in athletes. Dr Fredericson is an assistant professor and Dr Salamancha is a senior resident in the division of physical medicine and rehabilitation in the Department of Orthopaedic Surgery and Sports Medicine, and Dr Beaulieu is chief of the section of musculoskeletal imaging in the Department of Radiology at the Stanford University School of Medicine in Stanford, California. Address correspondence to Michael Fredericson, MD, Stanford University Medical Center, Physical Medicine & Rehabilitation, 300 Pasteur Dr, Edwards Bldg, Room R105B, Stanford, CA 94305–5336. Disclosure information: Drs Fredericson, Salamancha, and Beaulieu disclose no significant relationship with any manufacturer of any commercial product mentioned in this article. No drug is mentioned in this article for an unlabeled use.